I’ve always felt a dislike towards rich or powerful people. They seem snobbish towards the poor and the disadvantaged. But what I don’t realise is sometimes their regality is a reflection of their true identity that is honorable and pure. Esther must have been regal in every way, the reason she was chosen to be the Queen of Persia. The six-month treatment given to her seemed to have spoiled her well. But it’s not meant to spoil her. It was meant to mold her into what she was meant to be. I have been battling with an orphan mindset for a long time. (Maybe that’s why I love to recite the line, “Alms, alms…spare me a piece of bread” with wide, teary Puss In Boots eyes when I was in high school…nah.) But really, I’m 31 but I would move around like a sorry little girl by thinking I should not become better than others. I have always thought I’d offend people when I do. And this what hinders me to my calling. But no matter how I run away from the call, it always follow me. There are times I’d do well as an elder, an ate, a leader. But at the back of my mind, I’d tell myself I can’t do this…it’s because I’m afraid of failing. But Esther, an orphan, did not act like one. Instead, she stood out among others by going beyond the notch. 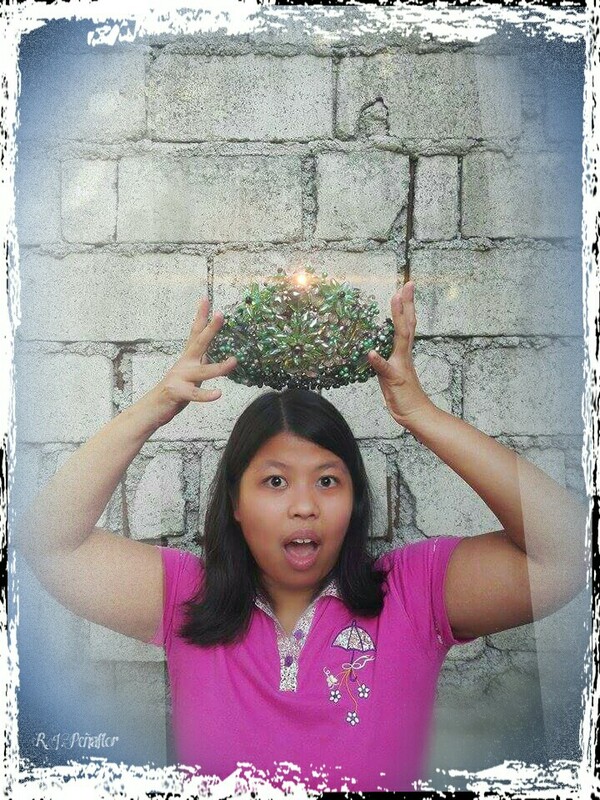 Before she became one, she already acted as a queen and already had the heart of a queen. Besides that, she dislodges all notion that all powerful and rich leaders are aloof and distant to commoners as she saves her Jewish people from being destroyed under Haman’s plan. So being a co-heir is like being adopted into the family of God! Because we accept Jesus into our lives, we share in His inheritance, the glory and yes, even sufferings. But I believe these sufferings are not meant to punish us but they are to refine us, knowing that Jesus Himself has carried the punishment meant for us on the cross. I need to act as one who is in authority, just like Jesus. I should not stalk around like a little orphaned girl asking for alms while the Father is willing to give the best for me. I need grace – extra, extra grace to get out of the wounds of the past and break off from the pride of the pity party in order to take the crown and overcome in love and boldness. May I become totally free, so as not to be hindered from what I am being called for. 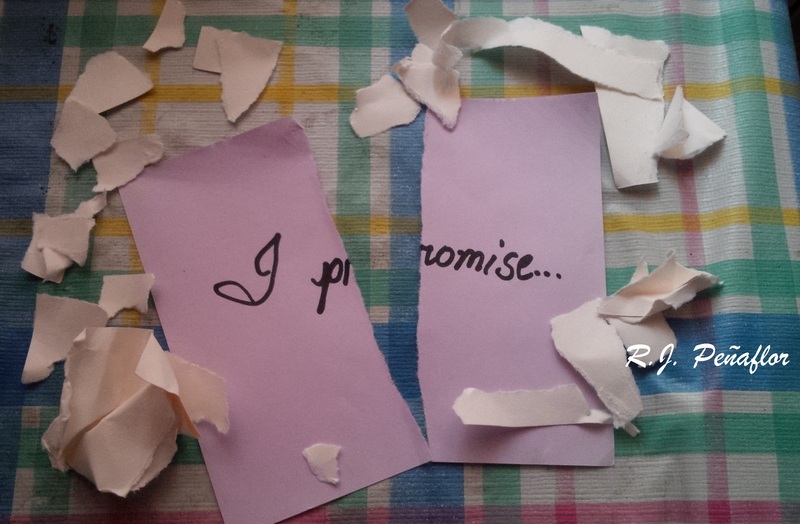 I wonder what makes people break their promises. For a number of reasons, I have been offended by so many friends who were not true to their word. I have a list of those significant ones who had gravely offended me. But the deeper offense was they callously walk away from it. I must admit these have greatly disappointed me, reason enough for me to get even. Who wouldn’t be disappointed when a friend did not pay for your fare after he said he would when you to accompany him to enroll in a university? Or when somebody disregarded the farewell gift he promised you before he goes abroad or before you resign from the company you both worked in? How about when a really special friend did not take you to the special place he has been telling you from the beginning? Perhaps, these things are small and unimportant to the ones who released these vows. Yet, it means a lot to those who had received these promises. Words are very significant. They should not be taken lightly. They are not made of thin air, but of power that can bring life and death. If sticks and stones can hurt us, words can hurt us more. How much more words that have been withdrawn from our trust, not having any closure on the matter? Most in this generation have lost the sense of commitment, watering down perspective on the power words can bring. Broken promises can destroy relationships and unity, signifying that the promise-bearer is not a person of honor. Every promise released is a binding thread between lovers, friends, family, and master and student. I am not being proud here. I have my share of delayed promises, but I’d always make sure that I keep my word, no matter how long it had taken. So, how about the list of broken promises? I leave them into the hands of my promise-keeping God. He is the One true Promise Keeper. His promises to look after you, to provide for you, and love you has never failed, generations after generations. What did He do to that list? He burned them up. He wanted me to show that His grace towards the promise breakers is wider than these broken promises. That I have to follow His example of giving them a second chance. He has given us endless chances to turn away from breaking promises while He waited for us. I’m so glad that there are always second chances given to us who are never perfect in every way. But we have to learn how to forgive, let go, and begin anew. The Lord has been that graceful. There are times that I feel so ashamed that He can be more faithful to me than I could ever be. Perhaps, one day, these broken promises will be redeemed. It might not be the same as before, but given another chance, they can be mended along with the trust that has been ripped with it. As the national government admits being appalled at the disaster left by Typhoon Haiyan (or Typhoon Yolanda as its FIlipino name) ten days ago, the rest of the world feels mutual. It’s like watching a horror movie, except it is in the primetime newscasts. However, being in the very scene of it still feels surreal to me. I would have loved to tag along with one of our teams assigned to Tacloban City last week. 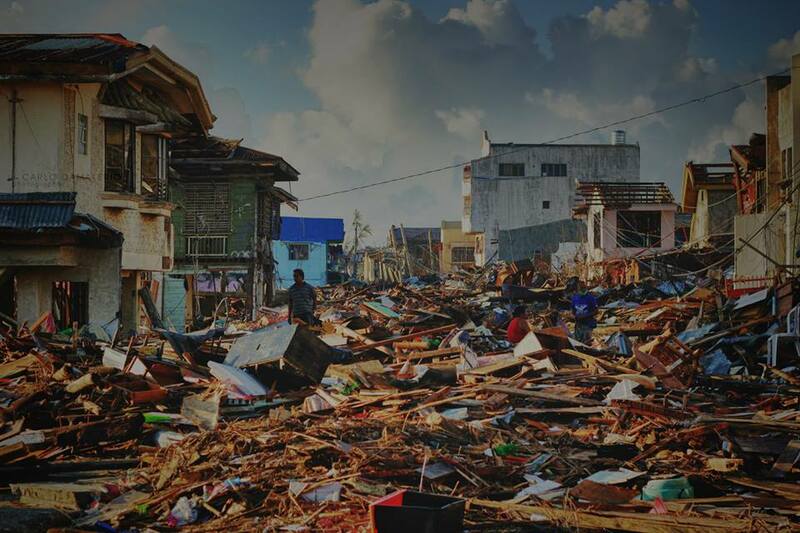 Tacloban, Leyte was one of the greatly devastated places left by Yolanda. But considering the place’s limited necesities for a woman like me, only an all-male team was sent. As first hand witnesses to a storm’s aftermath, I tried to understand the hardships they experienced. They had no place to stay, no food and water to sustain them (as they have given their provisions to the Tacloban people), and they have to endure the stench of the dead and of human waste. But how much more I tried to feel the heart break for the people who endure the loss of what they have owned and the loss of their very loved ones. What was left was their very existence, coping with the last strain of humanity nearly being snatched from them. They try to survive in a desolated town unfit for living. 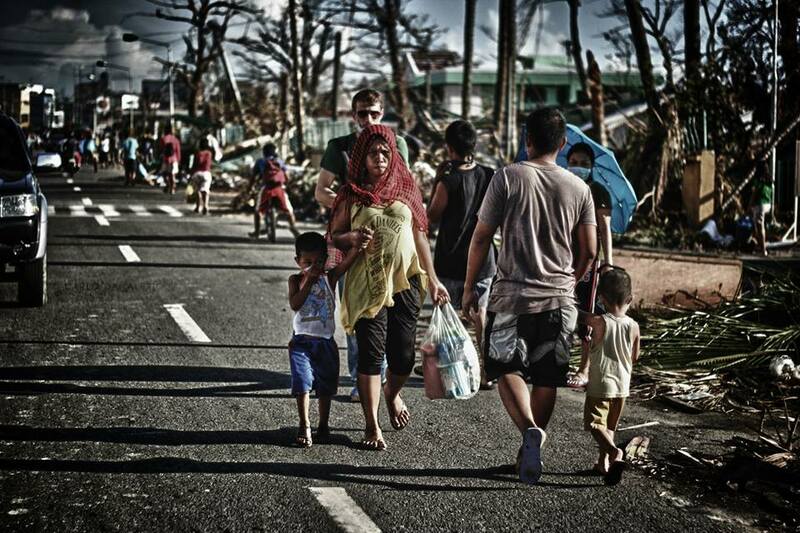 Tacloban just to give out a hug…or maybe a small act of kindness through food and water. But how far are we willing to go? How far would we be willing to sacrifice time and your comfort zone to feel their pain. Living there sounds too inhumane for most of us. Helpless, all we can do is sigh and speak out our thoughts and symphathy. As I watch from afar, it’s a pain to hear criticisms and politicizing at all sides. There’s this underlying contention between the main government bodies, the private entities, and the vox populi. We can talk too much. It’s easy to give blame. But can’t we just shut up and try to feel the pain of the victims themselves? Perhaps, it’s easy to make conclusions in what goes on in their everyday life. But can’t we think of focusing at their basic needs first? These people, are just like us — human, limited, and in need of one another. Perhaps, most of us can never understand how it is to be in their shoes. For us living far from them, we try to comprehend what flashes through our screens or what blares through our airwaves. But we can never see the whole picture. Who are we to judge conclusions, then? Perhaps, some of us can never get the chance to reach them personally. Perhaps, most of us might never understand the whole picture of what’s happening and why it happened. But setting aside our own conclusions and criticisms might help rebuild a new future. A little grace, a little love, through our what-we-have can uplift their spirits. Behind the camera, must be a more drastic story beyond words. But for the sake of love, must I dare ask? Would then this Blood make you speak love? I was hesitant at first. Even though there’s this deep urge to pray for him, I fought against it. I was too sick to pray. Sheila already prayed for him, anyway. But, Kuya Ar, our anchor last Tuesday, continued to complain about his headache. After the taping, the urge to pray remained in me. So, I had to pray for him and for his headache to leave. He then asked me to pray for a relative’s baby that has been sick for a while. Not missing the chance, we both prayed for the baby. Then, surprisingly, he prayed for me (who was bothered by colds and coughs for a while). I wondered how could I be so hesitant to pray. We’re both Christians, but I why was I too shy to pray? I reflected as I was riding the bus home. The Lord made me realize I was too selfish. I was looking at myself. I thought I don’t have to pray because I was too tired and too sick — I thought I can’t have the strength to pray. But God moves even through the weak. You don’t have to be ultra strong to release effective prayers. It is God who will move through your prayers. I then realized that if I hadn’t obeyed the Holy Spirit, no breakthrough would be released. No healing would have been brought forth to those who need it (including me). Had I disobeyed Him, it would have surely grieved His heart again. But the ultimate release here is the power of love. I believe this was a test of loving others. I was so focused to myself, I tried not to bother this tired self in giving a part of me to pray for others. Praying also has the need to exert physically, especially if there’s a deep burden that needs to be released. To pray for Kuya Ar and for other people (especially those I don’t know) is a test for me to release the love of God that has been poured into me. It’s a matter of giving to others and dying to myself that demonstrate what true love is. Should one needs to be perfectly strong to love others? If so, then we can never love anyway. But God proves His love is made perfect in our weak, imperfect human nature. A few minutes left to 6 am. I wanted to scream to keep going. The jeepney driver slowly paved the road to get more passengers. After that, traffic at the tollgate. Soon, I was late. The service left me. I sat in the jeep almost dumbfounded as they texted me that they have to go without me. Only a few minutes was left to get there. Only a few meters to run and I could have reached them. But what can I do? The service has to leave earlier an hour earlier than its normal departure schedule for an early appointment. I wanted to cry as I took an FX to work. I felt I wasted my time. I wasted my energy to wake too early. I wasted my money. Then, I checked myself. Yes, I tried. But I’ve been too confident that they would forgive me for a few minutes of being late. I guess I have been complacent. I have lacked discipline. Again, I asked the Lord what else was I lacking. A thankful heart, a praising breath — to bring out such things is hard when you wanted to blame everyone for leaving you. I realized this has been my prayer for a long time. To see, to hear, and to know Him more. Yet, these things will come when I call out to Him. I can only call out when I’m being pushed into the mire. Why should I cry over spilled milk when there is a promised land flowing with it waiting for me? When I stepped out of the FX, I have forgotten my bitterness. I have lost my indignation. The irritant I’ve tried to nurse was chased away by thankfulness and grace.